Sometimes situations arise where you have to transport your bike by other means. A flat tyre or other technical difficulties, a destination just a bit too far, what have you. 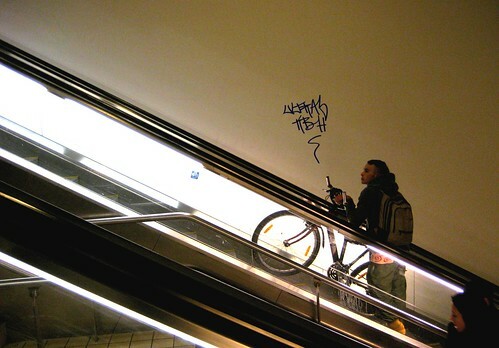 Being able to combine your bike with public transport is an important part of bike culture. 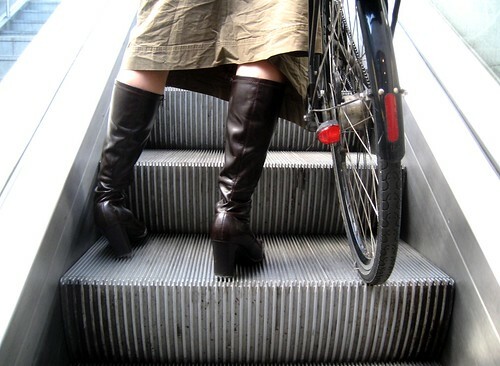 In Copenhagen you can take your bike onto the Metro, the local trains, the regional trains and the Intercity Express trains. 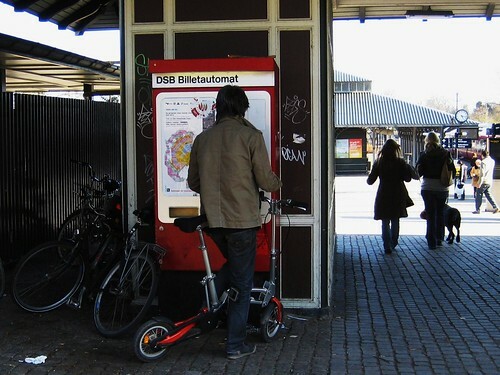 You'll need a ticket for your bike - 10 kroner for local journeys - which is half the price of a regular ticket. 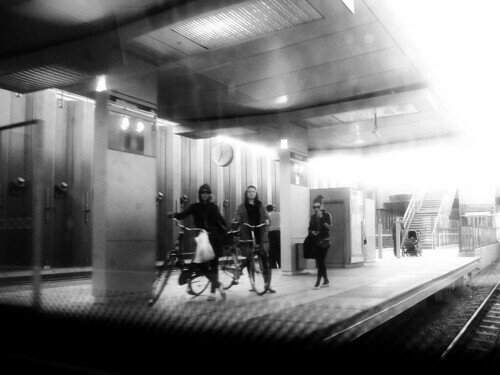 Every train station in the land has an elevator for bikes, prams and the elderly. And if you're travelling abroad by train, you'll have no logistic problems with getting to anywhere in Northern Europe with your bike. Popping down to Berlin for the weekend by train? No problem. Waiting for the Metro to glide to a stop. Busses, on the other hand, don't have any bike racks on them like in a few other countries. This is because most bus journeys cover the same routes as bike journeys, so there is simply no need. It's quicker and easier by bike. If you need to get your bike somewhere by taxi, all taxis in the nation are equipped with bike rack to accomodate two bikes. This costs 10 kroner extra, too. A small price to pay for convienence. It is, however, ironic that all taxis in Copenhagen are brand new Mercedes. But man, those leather seats are lovely once in a while. Sometimes, however, you can't be bothered to wait for the elevator. If there isn't that many people around, just pop it onto the escalator. Travelling from one city to another on the Intercity trains merely craves a little bit of muscle to get the bike onboard. Just roll up to the ticket machine and buy your tickets. Rising to the surface with his bike. Heading down to the Copenhagen Metro with style. Heading up from the Copenhagen Metro in style. Bike racks on trains and taxis. , i saw your blog , amazing blog , you have done good job on the topic fantastic work you have done . i have one blog related to legend of your life or legend of the world . in which i took some good personality i have took. but i wants more legend of the world so i requested to if do u have any legend on your life so please writes comments on this link . Great post. Every time I visit this site I am envious. If only my city had more stuff like this... sigh. It's a huge struggle to move bikes around unless you're riding on them, and even then that can be hard sometimes because of the lack of bike lanes! Your concept of Northern Europe is funny: it seems to be what for me is already Central Europe. I certainly count Berlin as Central Europe. Denmark is at the very southern limits of Northern Europe, and it extends quite far north from it. And the bicycling infrastructure starts deteriorating as you go, and you can't get everywhere by train so easily. Perhaps, when talking about the area of bicycling (and public transport) semi-utopia, one should talk of Northern Mainland Europe, not Northern Europe. Regarding the Northern Europe question, it is hardly unusual to refer to Northern Europe in this sense. My sense of northern europe is not mine alone. It is quite widespread. And quite historical in nature. "Northern Europe is a term for the northern part of Europe, though its precise boundaries are vague and defined variously." "Areas bordering, or in close proximity to, the Baltic Sea and the North Sea, i.e. north-western Russia (including Kaliningrad), northern Poland, northern Germany, the Netherlands, Belgium, Luxembourg, and the French region of Nord-Pas de Calais." "In earlier eras, when Europe was dominated by the Mediterranean region (i.e. the Roman Empire), everything not near this sea was termed Northern Europe, including Germany, the Low Countries, and Austria. This meaning is still used today in some contexts, such as in discussions of the Northern Renaissance." your blog makes my day, every time I read it. Your tranportation are very good for cyclist's. Here in Athens cyclist's demonstrates often asking traffic changes for bikes such as bike lanes and to allow bikes inside metro. Keep on the good photos. #1 is smoking hot, perfect framing, nice geometry, a real masterpiece. Amazing what you can achieve with twenty square centimetres of skin.